After rising modestly last week, gold and silver prices are inching closer to major breakout levels on the charts. We haven't yet seen any dramatic price action in the precious metals themselves. Behind the scenes, though, some significant things are happening in the markets that suggest a big move may be in the making. 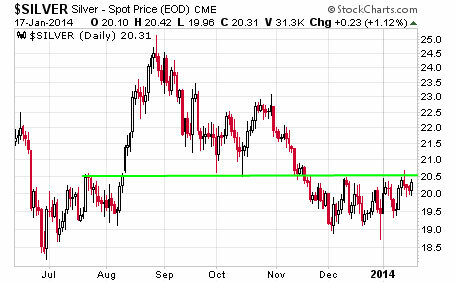 The $20.50/oz level represents a significant line of resistance for silver prices. When this level was broken last August, silver prices quickly shot up to $25.00/oz. We could see similar price movements triggered again by a solid close above $20.50. This time, the breakout would be off a base of support going back to last summer. That could give the market a foundation to keep rallying for months rather than spike up and retrace. We'll have to wait and see how prices react if/when they approach the $25.00/oz area. Although the possibility remains that short sellers will be able to defend their line in the sand and push silver prices lower near-term, we're seeing some near-term bullish indicators that augur for an upside breakout. For example, last week, all the gold and silver mining stock indexes closed strongly above their trading ranges from late November. Speculative money is moving back into the sector in anticipation of higher metals prices. As evidence, a thinly traded exchange-traded fund filled with small-cap silver producers and explorers, called PureFunds ISE Junior Silver Miners (SILJ), surged 13.3% last week. That is quite a positive divergence! Rather than try to chase these types of high-risk speculations tied to higher silver prices, investors can take a cue from the market action and load up on silver itself – before it starts posting double-digit weekly gains of its own. Right now, premiums on most of the popular bullion products Money Metals Exchange sells remain low – the one major exception being Silver Eagles, which are in short supply due to insufficient production by the dysfunctional U.S. Mint. The gold market looks more and more like a giant pressure cooker. The longer the sellers manage to keep the lid on prices, the greater the pressure inside the market builds. Registered gold inventories on the Comex futures exchange have sunk to their lowest levels in more than a decade. This, despite open interest (the number of claims on gold) being triple the size of what it was a decade ago. The ratio of claims on gold to actual physical gold in inventory has reached an astonishing 112 to 1! A forced "cash settlement" (otherwise known as default) on the Comex could potentially be triggered if just a small proportion of traders who hold long gold contracts demand delivery. That, in turn, could trigger a run on the bank for physical gold – which simply does not exist in available quantities sufficient to cover even a small number of outstanding claims held by people who think they own gold in various derivative forms. German Regulators: Gold and Silver Manipulation Is "Particularly Serious"
Adding to the bullish cash is a new accusation by German regulators that precious metals prices are manipulated in a manner that is worse than the Libor-rigging scandal that has already led to $6 billion in fines. The allegations are "particularly serious because such reference values are based – unlike Libor and Euribor – typically on transactions in liquid markets and not on estimates of the banks," Elke Koenig, the president of Bonn-based Bafin, said in a Frankfurt speech last week. At the same time, German-based Deutsch Bank suddenly withdrew from its decades-long participation in the daily London gold fix, where benchmark prices are set daily. The move gave rise to speculation that German regulators have evidence of criminal activity and are moving toward prosecution. The attack on precious metals prices by leveraged traders last spring caused quoted gold prices to sink below gold's average production costs at roughly $1,200 per ounce, putting pressure on new mine supply. Meanwhile, gold has flowed out of depositories in the West and traveled to Asia where more investors and institutions view gold as a bedrock asset to be held long-term, rather than traded short-term. This global shift has led to much smaller levels of actual physical gold bullion backing the trading exchanges in Europe and the U.S., increasing the likelihood of a delivery default coupled with a major upside move in prices. You don't really own gold unless it's in your actual possession or in secure allocated/segregated storage. A slew of earnings reports from S&P 500 companies are due out this week. "The reports will give the fullest picture yet of how corporations are faring and whether the market can advance further as Fed stimulus begins to recede," according to Reuters. Precious metals have shown an inverse correlation with the stock market in recent months. Meanwhile, the holiday-shortened week brings a light schedule of economic data releases. Thursday, Jan. 23rd - Jobless Claims. Thursday, Jan. 23rd - PMI Manufacturing Index. Thursday, Jan. 23rd - Existing Home Sales.